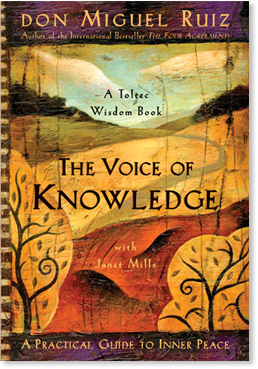 The Voice of Knowledge (eBook) - Amber-Allen Publishing, Inc.
Over 450,000 Copies Sold in the U.S. In The Voice of Knowledge, Miguel Ruiz reminds us of a profound and simple truth: The only way to end our emotional suffering and restore our joy in living is to stop believing in lies — mainly about ourselves. Based on ancient Toltec wisdom, this breakthrough book shows us how to recover our faith in the truth and return to our own common sense. Ruiz tells us that before we learn to speak, our true nature is to love and be happy, to explore and enjoy life. As little children, we are completely authentic. Our actions are guided by instinct and emotions; we listen to the silent voice of our integrity. Once we learn a language, the people around us hook our attention and program us with knowledge. But that knowledge is contaminated with lies. With our attention focused on all the knowledge in our head, we no longer perceive the world through the eyes of love; we only perceive what we have learned to believe. The voice of knowledge comes alive inside our head, and what is that voice telling us? Mostly lies. That voice never stops talking, judging, gossiping, and abusing us. It constantly sabotages our happiness and keeps us from enjoying a reality of truth and love. Ruiz shows us how to recover the silent voice of our integrity and find inner peace. When the voice of knowledge no longer controls us, our life becomes an expression of our authentic self, just as it was before we learned to speak. Then we return to the truth, we return to love, and we live in happiness again. More and more, I kept exploring the whole dynamic of the story that humans create. What I discovered is that the story has a voice —a voice so loud, yet only we can hear it. As I said before, you can call it thinking if you want; I call it the voice of knowledge. That voice is always there. It never stops. It’s not even real, but we hear it. Of course you can say, “Well, it’s me. I’m the one who is talking.” But if you are the voice that is talking, then who is listening? The voice of knowledge can also be called the liar who lives in your head. A beautiful Tree of Knowledge lives in your head, and it’s the home for guess who? The Prince of Lies. Oh yes, and this is the problem because the voice of the liar speaks in your language, but your integrity, your spirit, the truth, has no language. You just know truth; you feel it. The voice of your spirit tries to come out, but the voice of the liar is stronger and louder and it hooks your attention almost all of the time. The voice of knowledge is telling you what you are and what you are not. It’s always trying to make sense out of everything. I call it the voice of knowledge because it’s telling you everything you know. It’s telling you your point of view in a conversation that never ends. For many people it’s even worse because the voice is not just talking nonsense; the voice is judging and criticizing. It’s constantly gossiping in your head about you and the people around you. Every time we judge ourselves, find ourselves guilty, and punish ourselves, it’s because the voice in our head is telling us lies. Every time we have a conflict with our father, our mother, our children, or our beloved, it’s because we believe in these lies, and they believe in them, too. But it’s not just that. When we believe in lies, we cannot see the truth, so we make thousands of assumptions and we take them as truth. One of the biggest assumptions we make is that the lies we believe are the truth! For example, we believe that we know what we are. When we get angry we say, “Oh, that’s the way I am.” When we get jealous: “Oh, that’s the way I am.” When we hate: “Oh, that’s the way I am.” But is this true? I’m not sure about that. I used to make the assumption that I was the one who was talking, that I was the one who said all of those things that I didn’t want to say. It was a big surprise when I discovered that it was not me; it was the way I learned to be. And I practiced and practiced until I mastered that performance. The voice that says, “That’s the way I am,” is the voice of knowledge. It’s the voice of the liar living in the Tree of Knowledge in your head. The Toltec consider it a mental disease that is highly contagious because it’s transmitted from human to human through knowledge. The symptoms of the disease are fear, anger, hatred, sadness, jealousy, conflict, and separation between humans. Again, these lies are controlling the dream of our life. I think this is obvious. There is a movie that illustrates my point beautifully. It’s called A Beautiful Mind. At first I thought, “Oh, another spy movie,” but I became more interested when I realized that the main character is schizophrenic. He is a brilliant man, a genius, but he sees people who don’t exist. These people are controlling his life because he listens to their opinions and follows whatever they tell him to do. They are lying to him, and by listening to what they tell him, he is ruining his life. He has no idea that these people are hallucinations until his wife puts him in a mental hospital, where he is diagnosed as schizophrenic and given medication. The visions disappear, but the drug has secondary effects, and he decides to stop taking it. Without the drug, the visions come back, and he finds out that it’s true that nobody else can see the people he sees. Now he has to make a choice: go back to the hospital, lose his wife, and accept that he is mentally ill, or face the visions and overcome them. When he finally has the awareness that the people he sees are not real, he makes a very smart decision. He says, “I will not pay attention to them. I will not believe what they tell me.” The power the visions have over him is lost when he no longer believes in them. With this awareness, he finds peace, and after many years of not putting his attention on them, the visions hardly talk to him anymore. Even though he still sees them, they don’t waste their time because he doesn’t listen to them anyway. This movie is wonderful because it shows that if you don’t believe the voice in your head, it loses the power it has over you, and you become authentic again. The voice in your head isn’t even real, but it’s ruling your life, and it’s a tyrant. Once that voice hooks your attention, it makes you do whatever it wants you to do. How many times has the voice made you say yes when you really wanted to say no? Or the opposite — the voice made you say no when you really wanted to say yes? How many times has the voice made you doubt what you feel in your heart? How many times have you missed opportunities to do what you really want to do in your life because of fear – fear that was a reaction to believing the voice in your head? How many times have you broken up with someone you really loved just because the voice of knowledge told you to do it? How many times have you tried to control the people you love because you follow that voice? How many times have you gotten angry or jealous or lost control and hurt the people you really love just because you believed that voice? You can see what you have done by following instructions from the voice of knowledge — by following the lies. That voice tells you so many things to do that go against yourself, just like the visions of the character in the movie. The only difference between you and that man is that maybe you don’t see the visions, but you hear the voice. It’s overwhelming, it never stops, and we pretend that we are mentally sane! It is obvious that the voice of knowledge is the story talking by itself. As soon as an idea hooks your attention, your story goes in that direction. Then it takes you anywhere and everywhere without any direction. Every idea is repeating itself, and there are so many ideas in your head competing for your attention that the voice is changing from one moment to the next — boom, boom, boom! If you have to talk to yourself, then why not be friendly? Why not tell yourself how beautiful and wonderful you are? Then at least you have someone to talk to when you’re alone. But if the voice in your head is nasty and abusive, then it’s no fun at all. If that voice is telling you lies, if it’s letting you know why you should be ashamed of yourself or why your beloved doesn’t love you, then it’s better to be quiet. If you don’t like a person, you can walk away from that person. If you don’t like yourself, you can’t escape yourself; you are with yourself wherever you go. This is why some people try to numb themselves with alcohol or drugs. Or maybe they overeat or gamble to make themselves forget who they are with. Of course this doesn’t work because the storyteller judges everything we do, and this only leads to more shame and self-rejection. Long ago I stopped listening to the voice of knowledge. I remember that I used to go outside and tell myself, “Oh, look at the beautiful clouds, the flowers, mmm, they smell so good” — as if I didn’t know that! I no longer make up stories for myself. I know what I know. Why tell myself what I already know? Does that make sense? It’s just a habit. I don’t waste my time and energy by talking to myself. I no longer have that ongoing voice in my head, and I can assure you that it’s wonderful. You don’t need internal dialogue; you can know without thinking. The value of cultivating a silent mind has been known for thousands of years. In India, people use meditation and the chanting of mantras to stop the internal dialogue. To have peace in your head is incredible. Imagine being in an environment where there is a constant sound — bzzzz, bzzzz, bzzzz. The moment comes when you don’t even notice the noise. You know something is bothering you, but you no longer notice what it is. The moment the noise stops, you notice the silence and feel the relief, “Ahhh . . .” When the voice in your head finally stops talking, it feels something like that. I call it inner peace.